Steve Hillage, who was born on 2nd August 1951, first played in an outfit called Uriel who later evolved into Egg but by then Hillage had departed for college. When he finished college he was first in Khan and then in Kevin Ayers' touring band Decadence before joining the French-based hippie outfit Gong. He recorded his Fish Rising album with assistance from several Gong members, much of the material which was co-written with his girlfriend Miquette Giraudy. He eventually left Gong in 1976. The same year he recorded another solo album, which was produced by Todd Rundgren in Woodstock, New York, and included members of Rundgren's band Utopia. It was critically acclaimed. His 45, It's All Too Much, was a Beatles cover. He went on to record a series of solo albums in the late seventies with considerable recognition. In the eighties he became involved in production work. The nineties saw him recording again as leader of the loose knit dance music outfit System 7. Steve Hillage was of course much more than Gong's guitarist. He first ventured into the London's underground scene in the late sixties with Arzachel. Alongside Pink Floyd and Tomorrow, the band played the underground clubs like Middle Earth. After University, where he finished with a degree in philosophy, he hooked back up with Dave Stewart for the eponymous Kahn album on Decca, before joining Kevin Ayers' Decadence. From there, he would spend the next two years in the classic Gong trilogy line-up. 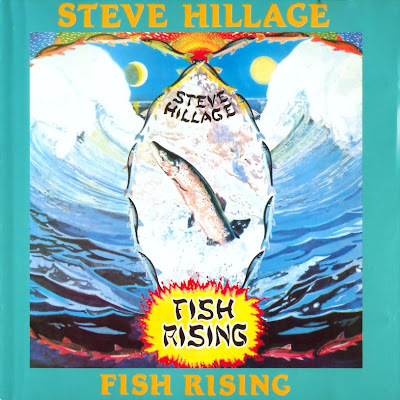 Post-Gong, Hillage quickly recorded his debut solo album, Fish Rising with most of the Gong cast and former keyboardist and partner Dave Stewart. It is the latter's keyboards that gives "Solar Musick Suite" a none to subtle nod towards the so-called Canterbury sound. Beginning with a cheerful melody, it travels through a few Gong-like instrumental sections before winding up. Hillage's distinctive echo-inflected lead is ever prominent. Side two is more typical of the direction his solo career would take. The main riff of "Salmon Song" is simple, repetitive and above all memorable, the anchor on which the song rests. Lindsay Cooper's oboe adds a foreign flavor, but the ever-present bubbling synths and the space whisper of partner Miquette Giraudy steer things more towards the Gong side of the fence. "Afterglid" demonstrates more of his prowess on guitar and eventide delay. From the opening bell, Hillage layers the guitar part, building up a foundation, before erupting with a massive lead. We're even treated to a rare acoustic piece that evolves into an Indian flavored section. This was his only record to feature ex-Gong members and the last with such overt Gong influence. The album scored a respectable 33 in the UK charts. The guitarist took a very brief residency with Dave Stewart’s National Health before embarking on his solo career.